Pro-Ject's Box Series never disappoints, and the Pre Box RS lives up to the high performance benchmarks set by the rest of the RS components. 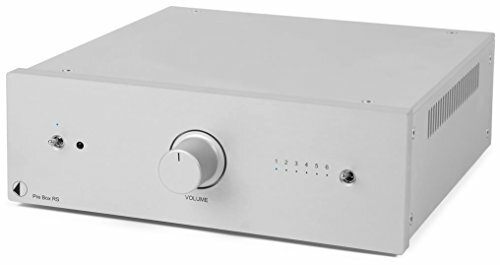 That means, despite its small size, this compact box offers sound quality, build quality, and a feature set rivaling and surpassing full-size components that cost a whole lot more. One huge feature that's responsible for the compelling sonic signature of the Pre Box RS is its hybrid design. The front end uses advanced solid state circuitry for speed and control. The vacuum tube outputs stage gives the Pro-Ject the warm and engaging sound quality of classic gear from the Golden Age of hi-fi. In addition to the sumptuous tube output stage, there are more specific characteristics make the Pre Box RS a true high-end preamplifier. First, it boasts a fully balanced dual mono design with separate 'mirrored' circuitry for each channel. This approach yields superior channel separation and, when done right as with the Pre Box RS, also offers superb soundstage and imaging. Allowing you to take maximum advantage of the balanced design, it offers three balanced XLR inputs plus an XLR pre-out. For use with unbalanced components and for adding more source components to the mix, it also provides three RCA inputs and an RCA pre-out. Second, the circuitry is 'Pure Class A' for no-compromise sound quality, featuring ultra-linear and low-now circuitry in a zero feedback design. Low ESR capacitors help keep distortion and noise levels vanishingly low, as does the use of input switching via relays. Partnering perfectly with Pro-Ject Amp Box RS amplifiers, Pre Box RS will give you the pure listening experience that the real audiophile craves. It utilizes a luxury casing that is available in silver or black finish. The metal case helps shield the electronics from vibration and electromagnetic interference - and it stays cool on the outside. The outboard DC power supply keeps the chassis size small.